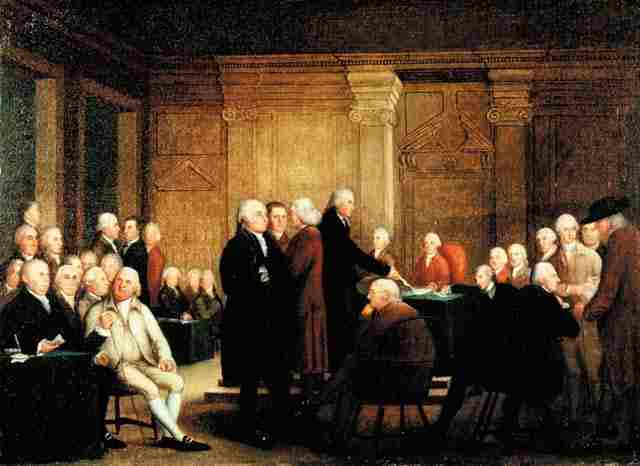 The Declaration and Resolves of the First Continental Congress, which is also known as the "Declaration of Rights," the "Declaration of Rights and Grievances," and the "Declaration of Colonial Rights," is a document that was written by the First Continental Congress on the eve of the Revolutionary War. The Declaration and Resolves are the Congress' response to Great Britain's treatment of the colonists, including the Intolerable Acts, a group of Parliamentary Acts that vexed the colonists. The Declaration and Resolves includes a list of objections to the Intolerable Acts, a list of rights the colonists believed they were entitled to, a list of grievances against Great Britain and a list of future plans of the Congress. The plans include a boycott of British goods until their grievances are satisfied, to send addresses to the citizens of Britain and British America pleading their cause and to send a petition to King George III himself.